Every year, the Company Car in Action show brings car makers together with the managers of some of the country’s largest company car fleets. The show has evolved to reflect the increasing need for more efficient, greener cars, and this year focused its efforts on a major environmental initiative. With this in mind, I went along to see exactly what the market has to offer company car drivers, and to see how well the Prius – with its class-leading emissions and efficiency – was received. Aside from the sheer unadulterated fun of some high-speed laps and the chance to compare the latest high-spec gadgetry, it was good to get an idea of which cars were affordable, without comprising on performance and the environment. Company Car in Action certainly lived up to my expectations – Toyota, Lexus, BMW, Citroen, Chevrolet, Ford, Honda, KIA, Mazda, Mini, Peugeot and Vauxhall were all there to highlight the very best they had to offer. All the manufacturers were showcasing vehicles that could offer the most favourable Benefit in Kind (BIK) and the best fuel economy, but there were also some highly-equipped models and some great driver’s cars. The best combined them all, of course. Hybrid cars created a big buzz at the event, and it became apparent pretty early on in the day that Toyota’s Next Prius and the Lexus RX450h were gaining a lot of interest. Lexus were all booked up from about 10am – the lure of the RX450h’s 14% BIK, congestion charge exemption and excellent fuel economy proving strong. The drive qualities didn’t leave drivers disappointed, either. 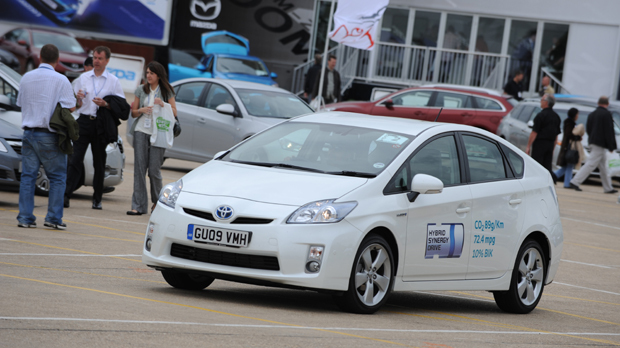 The Toyota Prius was the next most prominent vehicle on the track, and had sparked a lot of interest from its recent appearances and tour around the UK. The Next Prius has the lowest CO2 at the show (only 89g/km) which means no road tax to pay and 100% write-down in the first year, coupled with 10% BIK. Its Hybrid Synergy Drive helps it eke an impressive 72.4 miles from every gallon of petrol! The Prius’ new head up display (HUD) definitely won my vote for the gadget of the day. Even in the brightest sun, little blue numbers on the windscreen show just how fast you are going – and with HUD standard on all new Prius models you just can’t speed without knowing it! Depending on the mode you can also view the car’s eco display – helping you drive for economy – and on T Spirit cars you can even see directions from the sat-nav without taking your eyes off the road. All-in-all I found the event hugely enjoyable and interesting, and came away feeling impressed by the advance of hybrid technology. I’m keen to explore it further. Were you at the event? Let us know what you thought! Click here to see how Toyota’s range compares to other manufacturers’. After my June order for a photoelectric roof Prius and then reading the mail here. I started to search. I phone Toyota about the lack of a spare wheel. At the number on the top of this site. They knew nothing about it and tried to make it up as we talked. They gave me the head office number. I got their customer relations. The lady said a spare would make the car over weight and I could not have one. I said I could sit pepole in the car with their luggage and make it over weight once I had it and get a spare wheel if I wanted. She had no answer. I asked (1) Do the 15 inch wheel models have a spare wheel well ?. She didnt know. (2) Will Toyota sell a 15 inch spacesaver as an accessory ?. She didnt know. I pointed out that years ago the Reliant Robin would break the 8cwt limit with a spare wheel so they sold one as an accessory. She said she would phone back (She didn’t) In the mean time the lady at Bentleys Warrington had been digging for me and rang to say YES there is a spare wheel well and NO they did not make a 15 inch space saver wheel but I could order a 15 inch alloy. Alas with a tyre and VAT it would cost around £400 and would probably be to wide to fit into the well The good news is that I have a delivery date for the 12th of October. My first act when I get the car will be to jack it up and try an alloy wheel in the well PHEW!! I have just had notification that my Prius Tspirit will be at Listers PDI center 24th July for delivery 5-7 days later. By the way my order is dated 19th Feb 2009 with Brooklyn-Toyota. Toyota have honoured my deposit paid, although they didn’t received it, due to Brooklyn going into administraton Thank you Toyota. The issue of availability will be interesting to say the least. I ordered a car in June as well and I have no idea when I’ll get it. I hope to have it in time for the “59” plate at the beginning of September but who knows? Seeing as the new Prius is now the top selling car for the 2nd month running in Japan, I worry that Europe will have it’s allocation cut back if Toyota can’t build enough of them.